Well, I failed somewhat at keeping this updated, didn’t I? Oh well, just means I have more things to show all you lovely people! Now that Christmas is over, things have slowed down somewhat, which means I’ve had time for a couple of personal pieces, and to work on my FanFiction and children’s book. The latter is something that I have been wanting to do and have been working on in bits and drabs for about a year now, though I have finally settled on an artwork style that I like and plan to use for the illustrations. I had originally planned to use promarkers, a medium that I’m very comfortable with now and that I know can produce some delightful results. I wanted something soft, fluffy, adorable. More pastels rather than any big bright colours. 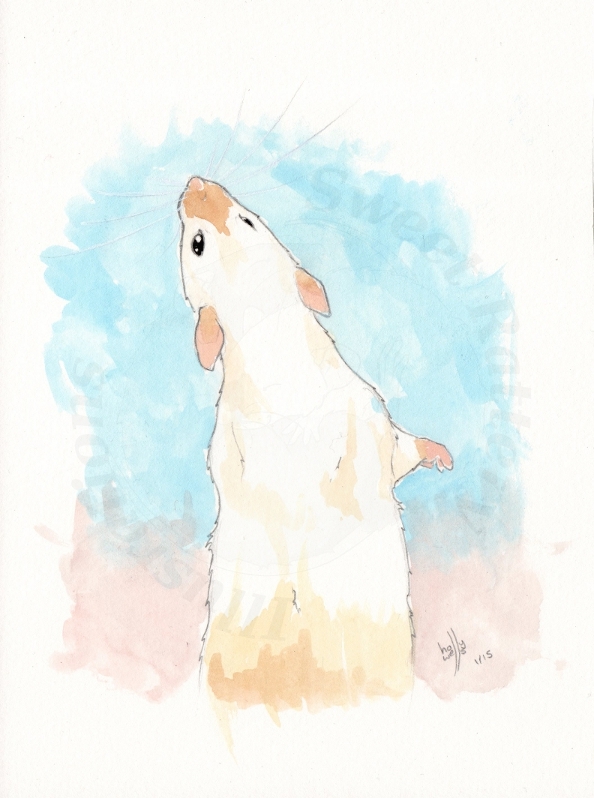 The book itself is about rats, and a little girl’s relationship with her first pet rat, so I wanted something that really shows off what beautiful and adorable little critters they are. And so it became that the gouache stepped up to the plate, holding a splodgy hand upwards and volunteering itself as tribute. Sure enough, I fell in love with the result. The first image is of the rat that the story is about – my darling Papa Zen. 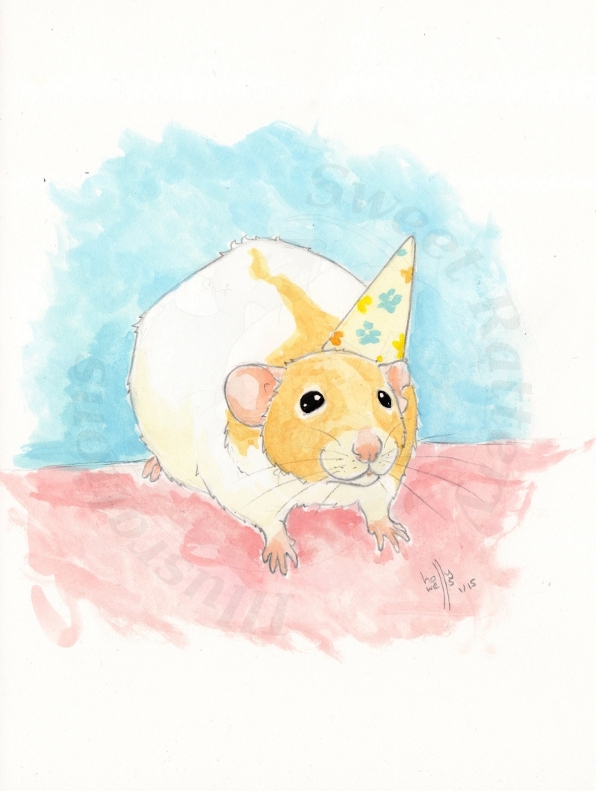 I’m not sure if the party hat will come as standard or not yet 😉 Papa Zen was my heart rat, my very best friend. He changed my life for the better, of that I’m certain. I feel that our relationship was something so beautiful that it could translate so well into a story of a little girl and her best friend. The second is one of my beauuutiful girls, Panya. She’s a sweetheart, and such a stunning girl, too, so I couldn’t not paint her. I think perhaps I need to decide whether to stick to pencil or work with a blank ink outline, so more experimentation is needed there. But overall this is what I want, this is the exact mood I want to see. Ok, almost kissing. Lets not get too far ahead of ourselves there! Goodness. 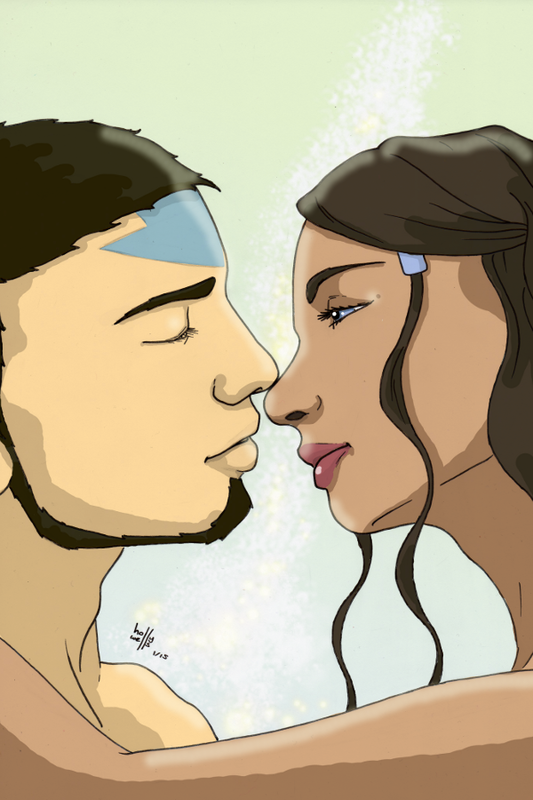 Occasionally I will break out the Tablet and do some digital work. However, I have a slight issue in that it’s almost impossible to get straight lines (hence why I ink outline and then scan in before colouring). I’m not certain if it’s because my tablet is only A5, or whether it’s the image software I use (GIMP 2.4), so if anyone can enlighten me on that I’ll be eternally grateful! Until then, that wonky shading is just my ‘style’, ok?